Quesadillas just isn’t Quesadillas unless it’s smothered in cheese.Would you believe if i said that these quesadillas were tasteful even without a speck of cheese? 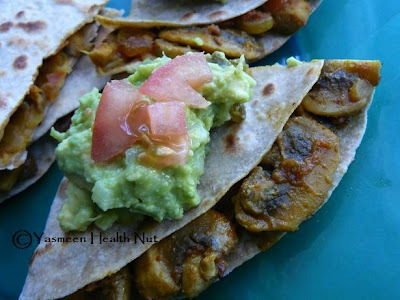 the luscious healthful guacamole makes up for the creamy texture of cheese and the meaty mushrooms make a fulfilling Quesadillas.To say the least these are sure to be any health nut's cherished meal. The brilliant recipe comes from Lisa's Vegetarian kitchen,being Tried and Tasted this month.Aparna of My diverse Kitchen hosts this month Tried and tasted event. Heat about a tablespoon of oil on medium heat in pan,add the onions ,saute until slightly brown 4-5 minutes,the add in the garlic ,spices and chillies or peppers.After a minute add the tomatoes and mushrooms,cook just until tender about 5 minutes.Remove from heat.Mix in the herbs. Heat a non stick pan on medium flame. Roast the tortilla or paratha on both sides. Spread some mushroom mixture. Fold , drizzle couple of drops of oil on sides of pan ,spread around and roast tortilla on both sides until lightly crisp. Remove and keep on a cutting board. Slice in halves or diagonally in to 3 triangles.Repeat for remaining tortillas. Spread some creamy Guacamole on top of Quesadilla and serve. 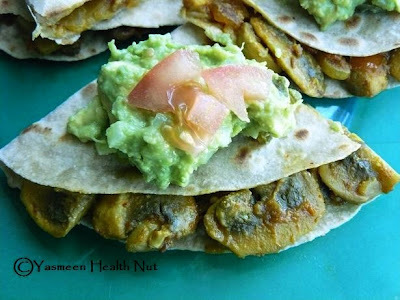 Quesadillas looks simply delicious Yasmeen, mushroom stuffing makes me hunger...Droolworthy dish! Love the Quesadillas....and love them a lot being very healthy wihtout cheese. I will try it for sure. Thanks for sharing Yasmeen. Also, thanks for dropping by my blog. I appreciate it. Hope to see you around. Have a wonderful weekend! Mushroom sounds perfect for quesadillas. I just love Quesadillas...urs are tempting me so much. Me a big fan of quesadillas and fajitas.I used to be a big fan of button mushrooms, but once after an overdose of it, i stopped eating them forever :( I still love oyster mushrooms which unfortunately are unavailable here. Anyway, i guess i'll keep all my woes to myself. I totally agree about that guacamole I bet it was perfect tasting with those yummy mushrooms. nowadays avocadoes are a staple in our diet. i can eat guac with every meal. Wow Quesedilla's are looking yumm....I m drooling over..!! Yummy!Yummy!Yummy! I could go for that. first tiem to ur blog..
That does look really filling, healthy, and tasty! i sometimes make quesadillas with leftover parathas or rotis,but always with cheese......these ones look good with my fav mushrooms. Love the mushroom filling with Indian spices, Yasmeen. Quesadillas look fabulous! I made these for my dinner tonight and they were absolutely wonderful! And you're right....I didn't miss the cheese at all! Wow looks so so yumy super delicous. Looks great. Mushrooms r my fav. Sure it taste yummy. I'm so glad you enjoyed this recipe. Thanks for checking out my blog! I've been trying to figure out what to do with mushrooms in my produce box :) This is great because I think pretty much all of us have these ingredients in our pantry. Love you dear. Avocado instead of cheese more than makes up in these quesadillas. An unusual and healthy option. Looks so yum and tempting with quacamole..Love quesidillas. Simple and delicious. isnt guacamole full of calories?